After The Force Awakens came out, there was a controversy over the lack of Rey toys. She was the main character of the movie, but kids couldn't get her action figure because she was a girl. Star Wars toys are for boys, Hasbro decided, and boys might not play with a girl action figure. In an era where toys are more heavily gendered than at any time in the past, that kind of cynical thinking might make sense in a boardroom somewhere, but the internet was quick to let Hasbro know that this absurd omission was not appreciated. She was the main character! But this was nothing new, of course, and nothing new in sci-fi or fandom, to be sure. After Avengers 2: The Age of Ultron came out, my daughter wanted Scarlet Witch and Black Widow action figures. Happy hunting, dad! It took a while, but I finally found a Scarlet Witch. I never did track down a Black Widow. So when The Force Awakens deal happened, one of our female contributors and I virtually arm-wrestled to see who would write a post about the whole thing. She, because she was an adult woman in fandom, and me, because I have little girls. I won, but in the end, I wasn't sure I could add much to the discussion that hadn't already been put out there. Fast-forward a couple of years, and this, then, is the happy version of what that post might have been. As I write this, two of my girls are asleep with their arms wrapped around Bumblebee, Wonder Woman, and Harley Quinn vinyl figures. At this point, those have not left the girls' side at bedtime for weeks and weeks. My youngest daughters have taken to randomly dropping into superhero poses and scrunching up their faces in tiny, tiny impersonations of grim determination in the face of bad guys. We are reading graphic novels together. 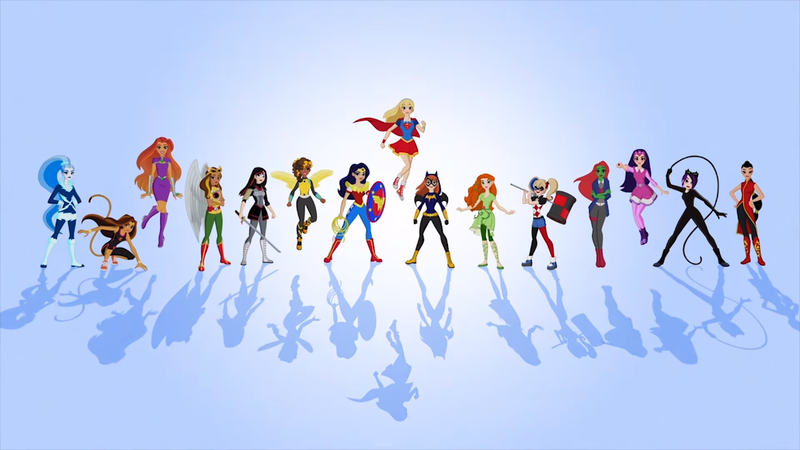 This is all thanks to DC Super Hero Girls, which, if you've missed it, is a franchise where most of the female characters, even the bad ones, from the DC Universe are thrown together as teenage friends at Super Hero High and its two rival schools. It maybe doesn't make that much sense if you know more about the characters, but that's not really the point. My family was introduced to the franchise when it launched with a comic issue my oldest daughter picked up at Free Comic Book day two years ago. She read it, immediately told me about it, and told me that she wanted to know how the cliffhanger resolved as soon as it came out. Anything that gets them reading more comics, I'm excited about. We have since picked up all three published trades, and while I can't say, as an adult, that they're the most compelling titles on the block, my girls all love them...even the girls that can't read yet. So I was pulling for the project from the outset, but it seems like, given the volume of DC Super Hero Girls stuff out there now, it's succeeded far beyond just a successful comic book line. There's a Cartoon Network show, two straight-to-video features, DC Super Hero Girls gummy snacks, and...here's the kicker...so, so many toys. That's an action playset and a weapon. For girls. And it makes me so happy. How's Marvel doing on the next aisle? Well, you can see that next to the Marvel section there's some more DC stuff. Those are legit, non-doll large action figures for multiple Wonder Womans (a pair of Gal Gadot and one of Lynda Carter, just out of frame) and Supergirl. If you want a large Black Widow, you can get her on the bottom shelf in a set with four guys. You can find a couple Rey, and a lot of (dead) Jyn Erso, which is an improvement, but it's still a pretty stark contrast to what DC is doing. I know somebody had a fight somewhere to make this happen. Somebody at Mattel gambled that you could make an entire action/superhero property aimed at girls and not go broke. And whoever fought that fight, I thank them, and I hope they're enjoying their raise. My wife sobbed through the entire Wonder Woman movie, because when she was growing up, Wonder Woman was it. She was the female superhero, not the best female superhero. Now, my girls can have arguments about whether or not Bumblebee is better than Wonder Woman because she can shrink down. Or if Batgirl is better than Supergirl because she's not taken out by kryptonite. It's entirely possible that DC Super Hero girls is about to reach a point of saturation (there's now a LEGO DC Super Hero Girls, too) where people might start getting tired of it. It's possible that it's just a money grab. But my girls don't care. They just dig the show, and playing with the toys. Three years ago, they wouldn't have had the option. And I think that's pretty badass. Posted by Vance K — father of children, cult film reviewer and co-editor of nerds of a feather since 2012, Emmy-winning producer, and musician.